November 10–11, 2018, 10:00 a.m.–5:00 p.m.
Los Angeles, CA (October 30, 2018)— Celebrate contemporary and traditional Native art forms at the Autry's 27th annual American Indian Arts Marketplace. Discover one-of-a-kind artwork for sale from 200 artists representing more than 40 tribes during the largest Native arts fair in Southern California. 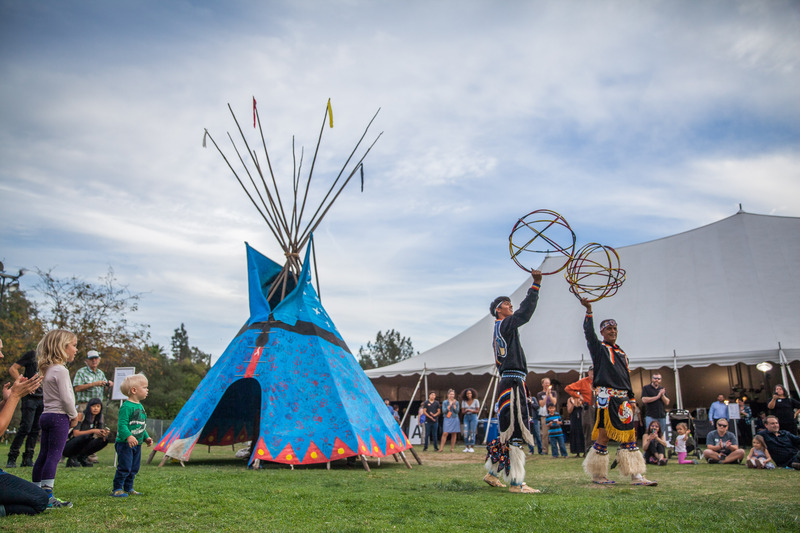 The weekend also includes food, performances, children’s activities, artist demonstrations, and a short play festival by Native Voices, the Autry's award-winning resident theatre company. The Marketplace offers something for everyone, with top artists from across the country selling sculptures, pottery, beadwork, basketry, photography, paintings, jewelry, textiles, wooden carvings, and mixed-media works and more. The American Indian Arts Marketplace Juried Competition will award 22 prizes in 11 categories, as well as a Best of Show prize and the Jackie Autry Purchase Award. Beyond the Marketplace tent, try light and fluffy fry bread from the acclaimed Auntie’s Fry Bread. The Autry’s cafe, Crossroads West, will also be open, offering a full menu that honors the unique culinary traditions and flavors of the American West. Saturday and Sunday, November 10, 11:00 a.m. and 1:00 p.m. Produced by KCET in partnership with the Autry, this documentary series explores and shares the environmental knowledge of Indigenous peoples across California. Coastal ecosystems are under threat from human-caused toxification, but the Tolowa Dee-Ni' are reviving the traditional harvesting of shellfish and redefining the human role in managing marine-protected areas. Two Ohlone chefs are revitalizing their language and food practices and adapting them for a modernist palate. Native Voices Eighth Annual Short Play Festival: FOOD! Native Voices invites playwrights to answer the question: What’s on the table in Indian Country? Like music or dance, food is a cultural expression. It can be as simple as what’s served for dinner, as complicated as the legacy of frybread, or as devastating as water shortages and climate change on subsistence hunting. The art of hoop dance honors cultural traditions from multiple Indigenous communities that first employed hoop dance as a healing ceremony. Today, hoop dance is shared as an artistic expression to celebrate, share, and honor Indigenous traditions. Try your skills in a workshop with world champion hoop dancer Terry Goedel (Yakama/Tulalip). Join this active presentation with Jacque Nunez and her son as they pass along Acjachemen traditions through lively songs and storytelling and share the culture of the Acjachemen Nation, which flourished in Southern California hundreds of years before the Spanish influx. Since 1989, Wildhorse Native American Association has been assisting urban Native American children and adolescents with cultural preservation. Gather around the drum with these talented youth as they demonstrate traditional powwow dance styles and traditional songs. See an extraordinary display of artistry, athleticism, and tradition in a multigenerational performance by renowned hoop dancers from the Goedel Family. Each dancer presents their own variation of the intertribal hoop dance, weaving in aspects of tradition and culture. Saturday and Sunday, November 10–11, 1:00–4:00 p.m.
Make a yucca paint brush, paint a stave game, then learn how to play the game with Jackson Huhuka-Nunez and Jacque Tahuka-Nunez—descendants of the Acjachemen Nation, the Indigenous people of Orange County. Admission includes all public events and museum entry. The Marketplace is free for Autry members. General admission is $14 for adults, $10 for seniors (60+) and students (with valid ID), $6 for children ages 3–12, and free for children age 3 and younger. For more information about the American Indian Arts Marketplace at the Autry, visit TheAutry.org/Marketplace.